Stewart Hollow Brook Shelter, Conn., AT NOBO mile 1,470.2, Wednesday May 21, 2014 — Swayed and I punched out of Kent around one o’clock with heavy restaurant lunches snuggling in our tummies. As I bumped along the trail, my ravioli offered several retasting opportunities. It was good, though not great, the second time around. Kent has a reputation among hikers for being snooty. It is one of those places where people with summer houses, and perhaps a few of them more elsewhere, congregate. Women named Buffy can be seen walk their dogs named Muffin on occasion. Nantucket red is everywhere. But that’s not the Kent we experienced. The locals were open and friendly. This morning people in line at the post office told me positive hiker stories. People everywhere were welcoming. We did pay $70 for two orders of fish and chips an ice tea and three beers plus tip last night. Prices like that may help color hikers’ opinion of Kent. A merchant told me more of the laundromat story. Seems young hikers last year were stripping to their birthday suits in the store because many only have the clothes they’re wearing. The owner tried to provide a changing room but the kids didn’t use it. IMHO, she should have called the cops. 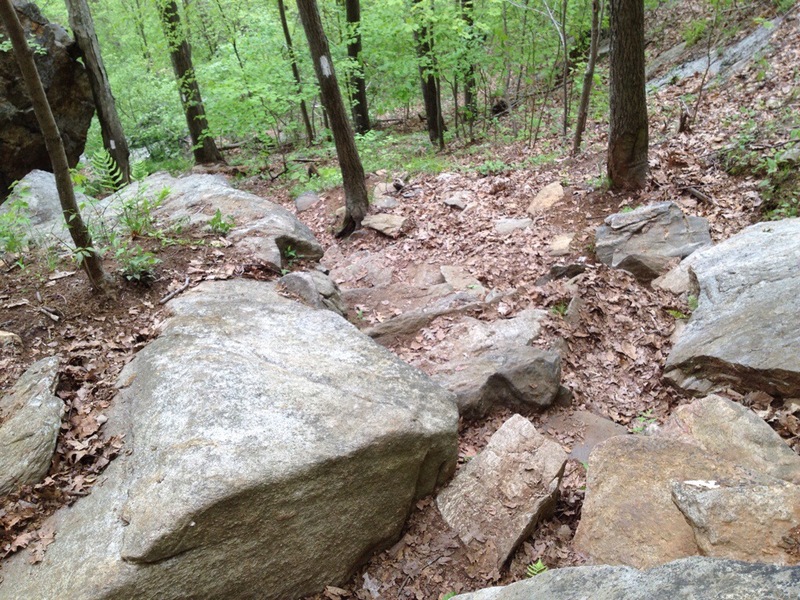 The hike out of town was a breeze right until we reached mile 1,467.0, St. John’s Ledges in the guide. The note said “steep stairs down to Housatonic River.” That’s an understatement if I ever saw one. It was nearly vertical and covered with slick leaf litter. Bad news. This wasn’t a hike as much as it was an amusement park ride without the safety features. I think my pace dropped to about an inch an hour. We made it safely, but not without a few scary moments. Notes: 1. My sleeping bag and rain jacket are on their way to my cousin Deb’s in Hanover, NH. An army poncho liner supplemented with a fleece and down jacket is the replacement. A water resistant running jacket will suffice in the heat. 2. Time will tell with rain on the menu for the next four days. Our choice is 10 or 20 miles tomorrow. All will depend on how slick the rocks are. Safety is number one. Don’t slip and do a face plant on some rocks. Sorry about the ‘improvements’. That’s progress, eh? The laundromat story turned out to be exactly what I suspected the offense was -naked guys. Would it really be too hard for a young guy to to carry an extra pair of shorts. Those stairs sound terrifying. Happy for you that you made it safely. Hiking = fish & chips without guilt = yum! OMG> I just looked up where Kent, CT, is!! for the first time, I felt that you are truly out in the wilderness — all alone. It’s such a big world, and there you are, a little spec making your way along a secluded trail in North America. Fascinating. And frightening. All best thoughts to you. On the other hand, I wanted to congratulate you for winning The Voice. Great job. Oh, hmmmm. Well . . . . . . . . maybe that was someone else — but it SURE looked like you. Well, like you maybe 30 years ago. It’s uncanny really. That guy can sing!!!! I wasn’t a fan at first, but he grew on me and I was rooting for him by the end of the show! That first step is a BIG one! I am so glad I got to meet you and all the other great folks that became part of my Spring 2014 section hike. Thanks for sharing your hike via WordPress, I will be following thru this site. Stay safe and send my regards to Swayed and BUS. We enjoyed your company. Will give them your best.